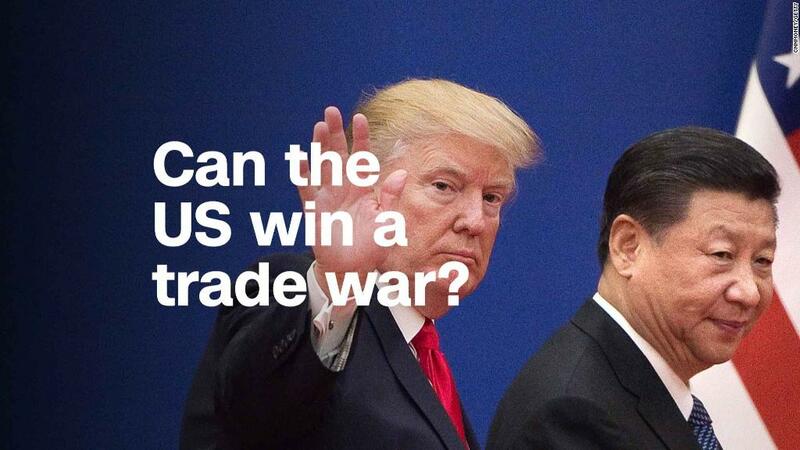 Can the US win a trade war with China? The tech sector has been mostly spared from the stormy financial weather of 2018. But deepening trade tensions could soon bring turbulence to Silicon Valley. Despite volatility in global markets, the Nasdaq is near a record high, sporting a robust 12% gain on the year. Netflix (NFLX) has more than doubled and other tech darlings like Adobe (ADBE) and Amazon (AMZN) are booming. But Morgan Stanley is warning that an emerging trade war will probably rain on the tech parade. The investment bank urged clients in a report published Sunday to sell the tech sector, downgrading the space to "underweight." 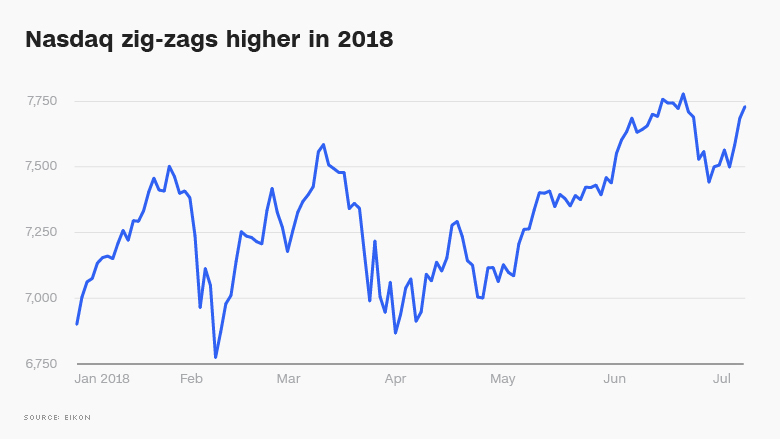 "These stocks have rarely, if ever, been so over-loved and over-owned," wrote Michael Wilson, Morgan Stanley's chief US equity strategist. "The risk of a proper rain storm in this zip code increases significantly" because of escalating trade tensions that could hurt corporate profits, he wrote. Morgan Stanley has been outspoken about dangers lurking on Wall Street. Wilson repeated his call for isolated financial storms that hit various corners of the market. He's dubbed it a "rolling bear market." That call has been mostly right so far. While the Dow and S&P 500 are little changed this year, the ride got seriously bumpy during the past six months. The Dow plunged by 1,000 points twice. Inflation fears sent Treasury rates spiking. Crude oil prices surged. And President Trump's crackdown on trade -- and retaliatory tariffs from trading partners -- have repeatedly spooked investors. In Europe, a political crisis in Italy briefly sparked financial chaos. Emerging markets have also been in turmoil. Chinese stocks collapsed into a bear market. The Argentine peso crashed to a record low against the US dollar, leading the country to reach a $50 billion bailout from the IMF. Although tech stocks fell after Facebook's data scandal, the industry -- and Facebook (FB) shares -- quickly recovered. In fact, Facebook hit an all-time high Monday and Mark Zuckerberg became the third-richest person on the planet. Meanwhile, the Nasdaq is less than 1% away from breaking its own record. But Wilson said "rolling bear markets aren't over until they touch every last corner, with the highest-quality areas eventually taken out to the woodshed." He noted that the financial storms of 2014-2016 didn't end until they finally hit the vaunted tech space in early 2016. "We think the risk is rising that US tech and growth stocks will get wet," he wrote. Of course, Wall Street doesn't seem overly worried. CNNMoney's Fear & Greed Index is sitting comfortably in "neutral" territory, recovering from a dip into "fear" last week. The Nasdaq soared 2.4% last week, its best in nearly two months. One reason for the upbeat mood: trade fears have knocked down Treasury rates, which had been one of Wall Street's biggest headaches. The 10-year Treasury yield has descended to just 2.85% and hasn't hit the dreaded 3% level since mid-May. The calmer action in the bond market "buffers stock prices" from uncertainty about how tariffs will hurt corporate profits, Nicholas Colas, co-founder of DataTrek Research, wrote in a report on Monday. Another big positive is the US economy. Wall Street thinks the economy grew at a very strong 4% rate during the second quarter. And concerns about runaway inflation have eased. The June jobs report, released on Friday, showed that wages are rising, but not spiking. Yet some think that investors are downplaying the risks in the economy. Jeff Gundlach, the so-called king of the bond market, pointed out on Friday that the yield curve is nearly flat, the federal budget deficit is "exploding," the Federal Reserve is shrinking its balance sheet and more tariffs loom. Those factors add up to "risk, not Goldilocks," Gundlach tweeted. Trade remains the No. 1 obstacle. The United States accelerated tensions with China on Friday by imposing tariffs on $34 billion worth of Chinese goods. Beijing quickly matched those tariffs. "Somebody had better blink soon because the risk of a recession caused by a widening trade war just increased significantly," Ed Yardeni, president of investment advisory Yardeni Research, wrote to clients on Monday. Not even tech stocks are immune to a trade war.